“They” are Coming – Are You Ready??? I love the smells and the flavors of the season. I adore the cookie exchanges, the parties and the school programs with adorable little people singing Christmas songs. But… wrap it all together with the other activities and parties and social gatherings, plus school holidays and it’s about all this busy mama can take. It’s almost enough for me to want to run for the hills. But I’ve learned the key element of “prep-ahead” when it comes to the holiday season! Some of my favorite ways to get holiday-ready is to shop ahead, meal prep ahead and get cookie dough made ahead. I make sure that my pantry is stocked and ready with popular holiday meal and side dish ingredients. I decide what cookies we will make for ourselves, for cookie exchanges and for social gatherings and I get the dough made and into the freezer. Sugar cookie dough freezes really well and makes for beautifully baked sugar cookies that you can frost and ice to perfection. Working ahead and getting a few things crossed off the to-do list in advance makes gliding through the holi-daze just that much easier! Take a look at this month’s freezer meals we have available in our Shop. 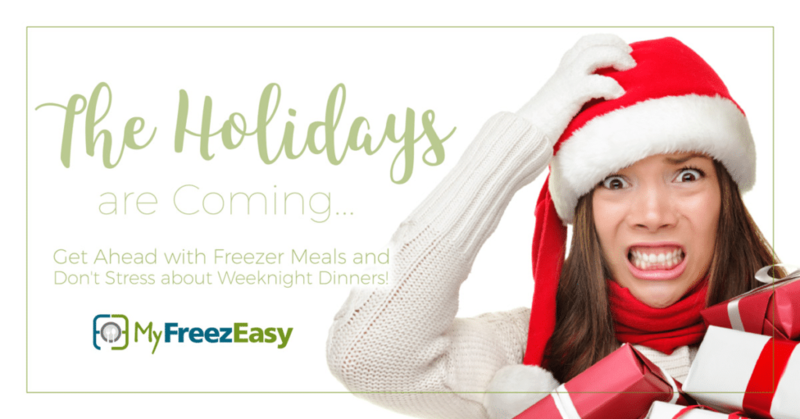 Learn more about our freezer meal plan apps and program, and get “one step ahead” of dinner now, through the holidays and beyond! Cheers to a fun and delicious holiday season! Traveling for the holidays? Tap here to learn how to take your freezer meals on the road!